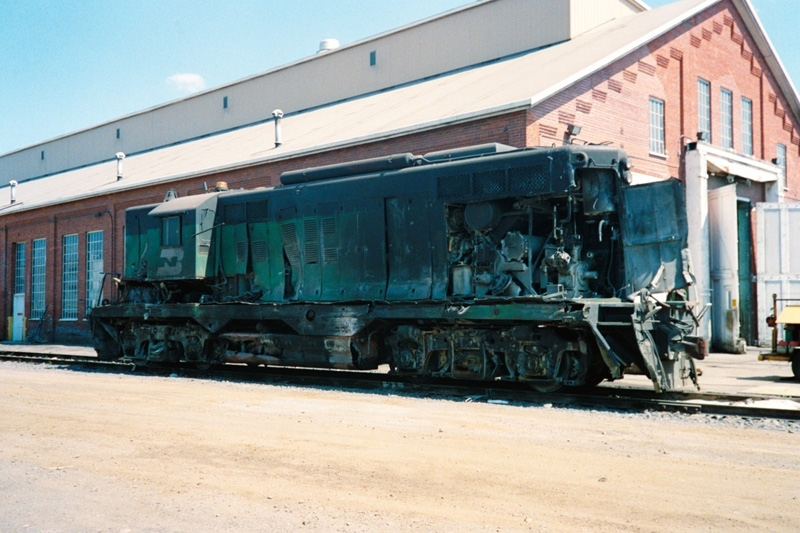 Head end locomotive at Spokane after the wreck was cleared. "This was a classic wreck. It was a whole train of maintenance equipment hauled by an actual locomotive, F-type. 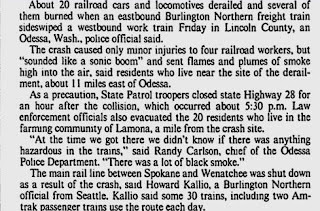 But the knuckle on the front of locomotive was removed and its space welded over and the train ownned by a private railroad contractor. 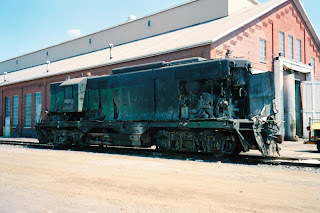 Anyway the engine was deemed "just a piece of maintenance of way equipment" so as to avoid having to use a locomotive engineer on it, and operated by a hapless track department employee whose knowledge of actual locomotive engineer duties was deficient and he "pist away the air" to use an old phrase, coming downhill from Mohler to Lamona. 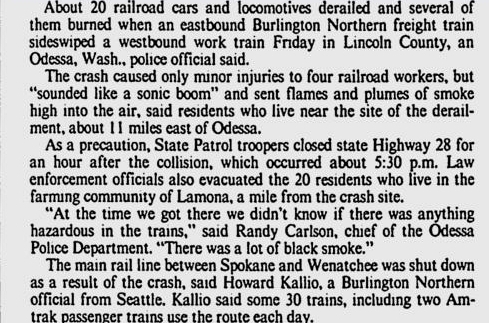 The BN Pilot conductor warned him several times as the train went out of control and then ran a red CTC signal at Lamona and crashed into the 1840 on the Quincy Local. //Dave Sprau (dispatcher in the office (but not on that district) when wreck occurred. " "Of course the crew on the grinder said the brakes failed. They all do. 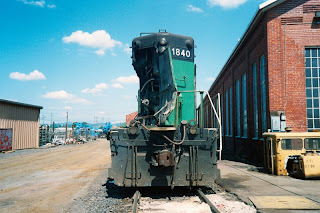 The grinder was being operated by the Loram crew and had a conductor pilot. Conductor is the wrong kind of pilot when the engineer is not qualified on the territory but by 1990 I had given up fighting over it. Conductor is cheaper. In this case, the Spokane Divison assigned the pilot so I had no stake in the game even if I wanted to protest. I was Pacific Division chief. It was my railroad but not my crew. The guy running the Loram didn't realize that he was on a 0.8% descending grade and waited way too long to try to stop. The conductor pilot didn't know that the guy running was waiting too long. "The train was 600. 690 was a Pasco train. "